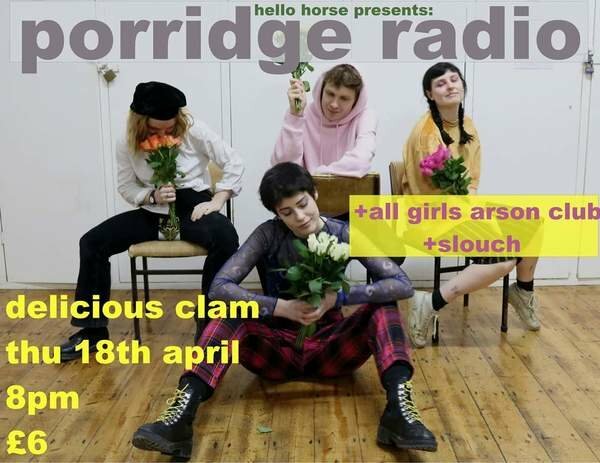 Sheffield's premiere seafood restaurant turns into a DIY music venue for ONE NIGHT ONLY to welcome Brighton indie darlings "Porridge Radio". Don't miss!! Delicious Clam accessibility info: DC is on street level, however there is a step up to enter. Step free access can be arranged, please get in touch with hellohorsepresents@gmail.com if you would like us to do so. Toilets are gender neutral, however they are not wheelchair accessible. If you require a ticket for a personal assistant in order to attend the gig, please get in touch at the above email and we will arrange a free ticket for your PA.